As I was growing up, my mother wanted me to know there was a big, wide world out there and to appreciate it, understand it, and be a part of it. When I was a kid, our Army family was stationed for two years in Daegu, South Korea. When I was a preteen, my mother received a Fulbright scholarship, and we lived for a year in Ankara, Turkey, where I learned the language, customs, and culture. Later, when my mother was a high school Spanish teacher, I traveled with her and a dozen of her students who sold candy bars to fund a trip to Mexico City. What I did not realize was how happily my passion for librarianship would collide with what my mother taught me—to be a citizen of the world. My first connection was as an LIS student at Simmons College, when I took an international and comparative librarianship course from professor Patricia Oyler. As ALA president I am reminded how much ALA—and we as members—are an important part of a wider global library community. This past July, I went to the Dominican Republic to keynote the library conference sponsored by the Global Foundation for Democracy and Development, hosted at the Juan Bosch Library in Santo Domingo. All the library staffers I spoke with were honored I came and spoke about how they look to ALA as the global leader in the library community. ALA as an association is respected around the world for what it stands for and for what it does to improve the profession, libraries, and library services. It is our collective work as members—including nearly 2,000 members from 105 countries outside the US who bring diverse voices and perspectives—and ALA staff members who make this so. In the past four years, ALA members across the world have contributed more than $80,000 to help rebuild libraries in Chile, Haiti, Japan, and the Philippines. 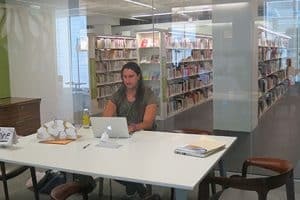 Through the Library Copyright Alliance, ALA members and staffers have played a valuable role in fighting for the rights of library users at the World Intellectual Property Organization. Through the Campaign for the World’s Libraries, in partnership with the International Federation of Library Associations (IFLA), ALA has helped create awareness, guidance, and resources for library associations globally to make their case for the value of libraries and librarians. ALA’s partnership with the Guadalajara Book Fair is in its 15th year, helping librarians across the US to improve their Spanish-language collections while learning more about their communities’ cultures. ALA’s new partnership with the Sharjah International Book Fair will provide new learning opportunities for ALA members and nonmembers this November in Sharjah, United Arab Emirates. And at the recent IFLA Congress in Lyon, France, a three-year partnership program, beginning in 2016, was formed with the German library community. I was pleased to sign the agreement on behalf of ALA with Bibliothek & Information Deutschland (BID). These are just a few examples of ALA’s global citizenship. Whether you are helping immigrants adapt, hosting a librarian from abroad, programming, participating in another country’s library project, or attending an international conferences, we do make a difference in the world. 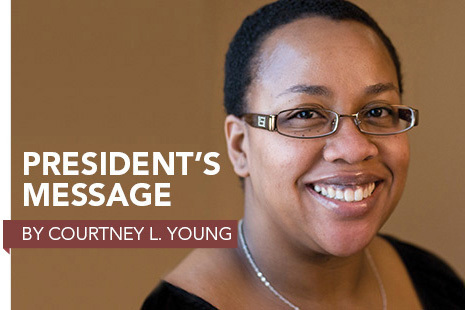 COURTNEY L. YOUNG is head librarian and professor of women’s studies at Pennsylvania State University, Greater Allegheny campus in McKeesport. Email cyoung@ala.org.